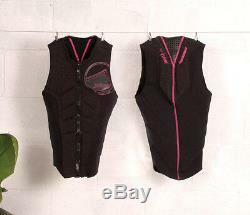 Liquid Force Ghost Comp Ladies Wakeboard Impact Vest. The Liquid Force Ghost Competition Ladies Wakeboard Impact Vest - Designed to fit your shape, be as lightweight as possible, but also to take an impact and protect as needed. Just like the mens Ghost Comp, the womens version is a game changer! The Liquid Force Ghost Competition Ladies Wakeboard Impact Vest has the ultimate in vest technology the Ghost Comp has a stitch-less Flex Panel Architecture (LF Exclusive), a Bio-Spline 3D Curve (LF Exclusive) and it uses 4XS Stretch Foam (LF Exclusive). What this means is lots of innovation and design have gone in to making this vest flexible, comfortable, and a premium fit. Chill Stopper keeps you warm on those cold mornings, making this vest one you cant live without. Please note: This vest is not a safety device and should not be worn by non-swimmers. THIS IS NOT A LIFE JACKET! X Small: Chest 28-32 / 71-81cm UK 2-4. Small: Chest 32-36" / 81-89cm UK 6-8 Medium: Chest 36-40" / 89-102cm UK 10-12 Large: Chest 40-44 / 102-112cm UK 14-16. Liquid Force Ghost Competition Ladies Wakeboard Impact Vest Product Details. Stitch-less Flex Panel Architecture Liquid Force Exclusive. Bio-Spline 3D Curve Liquid Force Exclusive. 4XS Stretch Foam Liquid Force Exclusive. Flex-Span Neoprene Fits like a second skin. Chill Stopper lined chest panels and Stretch-Light Lining. Tapered waist and wide arm openings. This is a Competition vest designed to be thinner and lower profile than an approved flotation vest. It will give great freedom of movement BUT it is designed to be. We Are Here To Help. Call Absolute-Watersports on 01597 850114. The item "Liquid Force Ghost Competition Ladies Wakeboard Impact Vest XS or S or L. 64076" is in sale since Tuesday, June 27, 2017.